The Alcazaba and Roman Theatre in Malaga are two of the city’s most renowned and visited monuments. 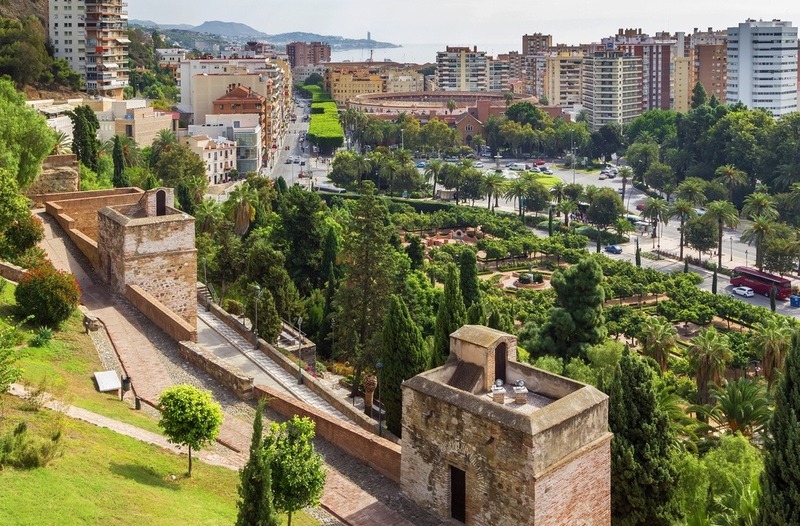 Discover their history, and fall in love with Malaga’s hideouts. The Alcazaba and Roman Theatre’s historical and artistic value make them two of the city’s must-sees (discover which the other unmissable monuments are by clicking here!). Located in the historic centre of Malaga, in street Alcazabilla, the Roman Theatre lies at the foot of the Alcazaba, and from here, you can’t miss out on the path that leads to the Castle of Gibralfaro. Go on and read about the history of the Alcazaba and Roman Theatre, as well as useful tips to know before your visit! The Roman Theatre was built in Malaga in the 1st century AD, when the Romans, under August’s empire, colonised this area. It kept being used as a theatre until the 3rd century AD. Between the 5th and 6th century, the Theatre was converted into a cemetery, until the Byzantine occupation in the 7th century. After this period, the Theatre was abandoned and it’s believed to have been pillaged by the Arabs to build the nearby Alcazaba. It was only in 1951 that the theatre was discovered, thanks to the decision of destroying the “Casa de la Cultura”. 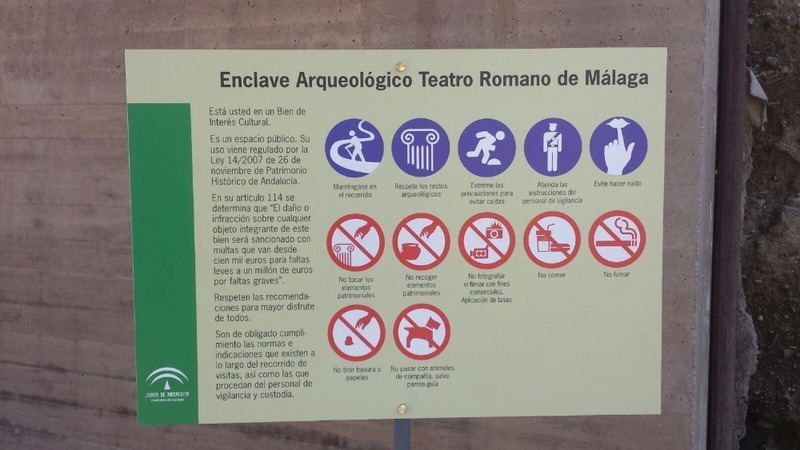 FYI, the Casa de la Cultura was built on top of the Roman Theatre and it consisted of an Archive and Library Palace, also known as “The Home of the (Lack of) Culture”. In 1972, the Theatre was declared Spain’s Bien de Interés Cultural. In 2010, the Visitor’s Centre of the Roman Theatre was inaugurated in the square facing the theatre. This rectangular-shaped building is made of iron, wood, and crystal, on whose outdoor walls, you can read some parts of the Lex Flavia Malacitana (a law that ratified the passage of Malaga from confederate city to city of the Roman Empire, with all the advantages that implied). The Theatre’s Visitor’s Centre hosts an exhibition of the Roman world, enriched by the pieces found in the Theatre during the excavation process. 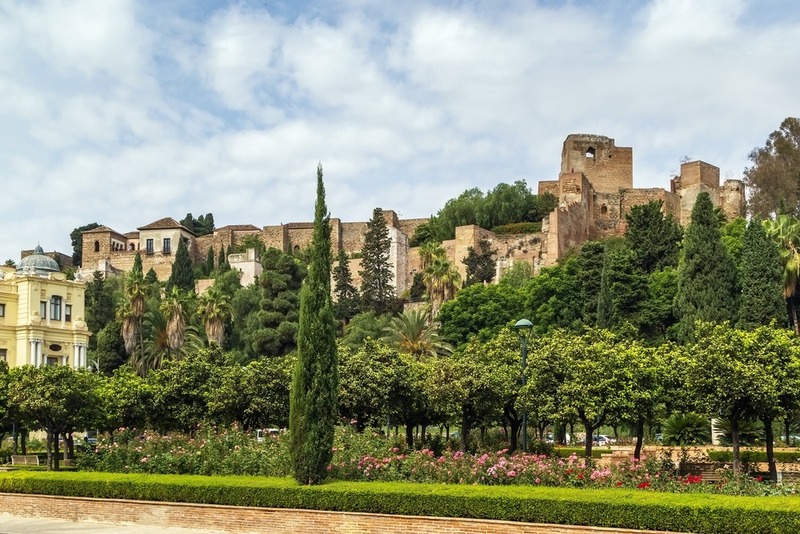 You may be familiar with the word “Alcazaba” if you’ve already read anything about Andalucia. In fact, “alcazaba” comes from the Arab word al-qaṣbah, which means “citadel”, and many (if not all) Andalusian cities have their own alcazaba. Put simply, the Alcazaba is a fortress in whose interior are palaces and gardens, usually built during the Arab kingdom in Spain. Malaga’s Alcazaba was built in the 11th century when the city was under the laws of Taifas’ Grenadian king Badis ben Habús. Pieces pillaged from the Roman Theatre were used to build the Alcazaba, for which nowadays, you can spot Roman columns and capitals throughout the fortress. In 1279, Malaga passed under the Nasrid kingdom, and the Alcazaba underwent an almost-complete reformation. This is why, the Nasrid marks can still be seen in the fortress, where defensive technology mingled with the beauty of an Arab palace, characterised by square-shaped patios and stunning plays of light. However, the Alcazaba’s distinctive features are the three battlements that surround it, which make the Alcazaba one of the most spectacular examples of Arab architecture in Spain. Its location on a hillside overlooking the city and the bay also ensured its defensive supremacy. Later on, the Catholic Monarchs used the Alcazaba as a palace when they conquered the city in 1487. Nowadays, the Alcazaba welcomes an archaeological museum where former Nasrid’s pottery and ceramics are displayed. The Alcazaba is connected to the Castle of Gibralfaro by a walled path named “La Coracha” (which, at present, is closed to the public due to maintenance work), which you can go through on foot and let the eye-filling views of the city inspire you at the same time that you reach the Castle. La Coracha is characterised by lush vegetation that ranges from crimson bougainvillaea to rows of orange trees. Legend has it that during the Nasrid kingdom, Christian prisoners were kept in the Alcazaba’s dungeons. The desperate hygienic and living conditions they had to bear, forced the prisoners to ask to be carried to the Torre de los Deseos (Tower of Wishes) to be executed. There, their last wishes were satisfied by an odalisque, before being executed and an end being put to their sufferings. Although there’s no proof that one of the towers of the Alcazaba was ever called that way, the “Legend of the Torre de los Deseos” (or “of the Odalisque”, as it’s also known) contributes to the mystical aura that surrounds this monument. The visit to the Alcazaba usually lasts 1 hour and a half. You can access the Theatre either from the Visitor’s Centre or from the entrance near the Alcazaba’s one, which will lead you directly to the grandstands. Ask for the video that shows how the Roman Theatre was like, as the first part of the visit to the Theatre. The other two parts are the museum and the theatre itself. Spanish guided tours are available from Tuesday to Friday for groups of at least 5 people. 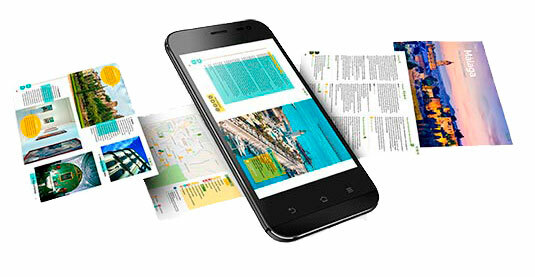 You’ll have to book the tour by calling +34 951 501 115 or sending an email to teatroromanomalaga@juntadeandalucia.es. The Alcazaba is free on Sundays from 2 pm until the closing hour. The Alcazaba is provided with an elevator to ensure everyone enjoys its beauty. The elevator is located in the street Guillén Sotelo, facing the back door of the Town Hall, and it doesn’t work on Monday. If you feel tired, enjoy the sunshine comfortably sitting in the small bar located inside the Alcazaba. The entry of the Alcazaba welcomes the statue of Juan Temboury, one of Malaga’s most important people, who dedicated his life to the preservation of this monument. 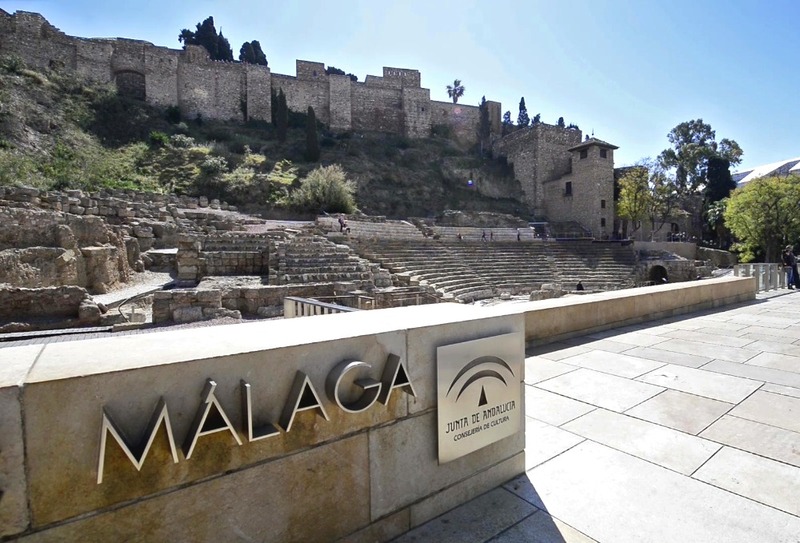 What piece of information didn’t you know about the Alcazaba and the Roman Theatre in Malaga? Tell us in the comments below!